Many house buyers experience an awful situation where their dream home is discovered but their current property is not sold yet. Or maybe it is on the market but a worthy buyer is not found yet. This would mean a lower price for selling their current house quickly in order to shorten the time between two settlement dates which is again a stressful scenario. Whilst everyone sees very little options in this situation, availing a bridging loan can allow the property purchasers to act positively and confidently, purchasing their dream home before the current one is sold and in most cases capitalising on the situation. A short–term bridging loan allows home buyers to buy or upgrade properties easily. They don’t need to coordinate settlement dates or find interim housing and will be ready to buy from the moment you enter the highly competitive property market. Where can you get the Bridging loan? You will get many options to get bridging loan for your emergencies. It is your choice which option you will select to get the loan. There are several bridging loan provider companies and local bodies are available who can provide you financial help on your bad time. You must approach the trustworthy person or company who are capable to provide required money instantly. You can also surf the internet to know about nearest Bridging loan companies. You will get to know about all other requirements of these companies after approaching them. 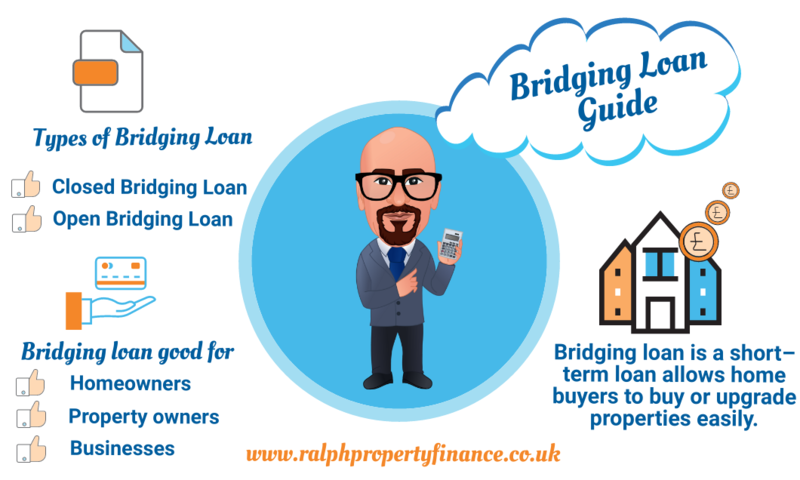 We can classify Bridging loans into two categories, one is the Closed Bridging loan and another is Open Bridging loan. Types of bridging loan are classified according to their names and categories. You will come to know more about these loans from loan Provider Company. It is very necessary to clarify all the things to your loan provider like the cause of loan, amount you needed and time you required to return the amount. Closed Bridging loans: These types of loans are given for a limited time period. You have to return the amount according to the time given in your contact. These loans are for those peoples who can pay the return amount within short of time. The interest rates of this type of loans are lower than the open bridging loan. Usually, businessmen and other such persons avail this type of loan. Open Bridging loan: You can guess the definition of this loan with its name. There are no time limits to return the amount. This type of loan is very beneficial if you are going to get much benefit from the loan amount. The interest rates of the open bridging loan are quite higher than the closed bridging loan. You have to pay higher interest rates due to facilities providing by Bridging loan companies. How much money can you take as Bridging loan? It is not decided in advance that how much money you can take a bridging loan. The terms and conditions of every company are little different from each other. You can get the loan nearly equal to the price of the property or anything that you are using as security. Some companies are using the Bridging loan calculator to calculate the loan for customers. You will come to know all the details after getting in touch with the loan provider. A bridging loan or bridging finance is whilst you borrow the funds required to settle the assets being bought you keep the existing mortgage for your present-day home. Mortgages are held by the same lender over both estates. The lender then permits interest to accrue at the bridging portion of the mortgage for up to 6 months giving the borrower time to sell their first property. The total amount borrowed plus an allowance for interest is referred to as the ‘Peak Debt’ and after selling the first property, the net proceeds are used to reduce the overall mortgage amount. The closing debt is referred to as the ‘End Debt’ and is then transformed into an ordinary loan product. Lenders work things out pretty differently. However, the traditional rule that the borrower only has to be able to prove that they can service the End Debt not the Peak Debt. You will typically have the possibility to make repayments on the existing loan or proposed End Loan even as the bridging component has the interest capitalised on the mortgage until the present asset is sold. 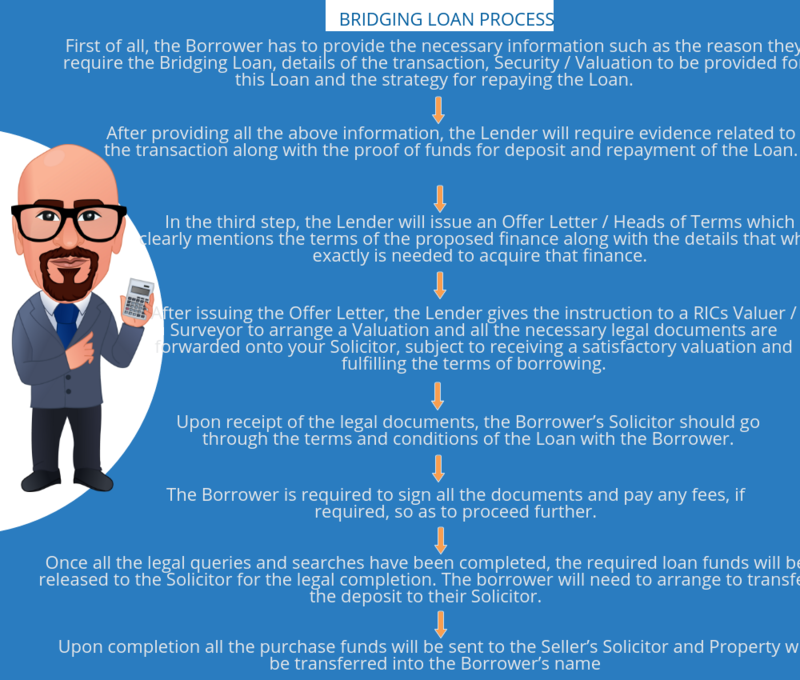 Mostly, bridging loans are required by landlords and amateur property developers, including bidders purchasing a lucrative property deal at an auction where a loan is needed quickly. They may also be offered to fat borrowers who want effortless lending on residential and commercial properties up-gradation and developments. When assessing the money, the lenders will look at the equity in your current home. The maximum Loan: Valuation Ratio is generally 80% to 90% depending on the moneylender. Most of the lenders offering commercial and residential short-term bridging finance dispense the maximum amount on the condition that there is an End Debt. However, in cases where there will not be an End Debt such as when you are moving into a less costly house, the fees associated with your loan will generally be greater. Moneylenders may require proof of selling the current property as a pre-requisite for loan approval. It can be a copy of the sale contract. Rates on bridging loans are now quite similar to any standard home loans provided by any private or government lender but interest will be accruing during the time it takes to sell your current home. Do not overestimate the selling price of your current property and get a property report or get its accurate valuation through any property evaluator agencies. The earlier you sell your property the better it is for your pocket – don’t delay – be decisive and think with your brain and not emotionally. Bridging finance can be ideally suited to the builders, developers, investors and individual buyers to act instantly after locating the desired property and can capitalise on the opportunity. Buying a lucrative property deal before selling the existing home can become easy by availing a bridging loan from various financial institutions available in the property market. Also, a bridging loan helps you to move home in an ideal manner; you will always have a home and you don’t have to coordinate settlement dates. Move into your new property first and sell your first one later. Every lender has a different policy and ways of assessing bridging loans and it is quite diverse. Some lenders require the loan acquirer to be able to service the peak debts interest while others don’t offer bridging loans at all without looking at the entire peak debt. A genuine and reliable broker is one who offers bridging loans only by seeing the end debt. The thumb rule suggests that you will need at least 50% equity in your existing home before applying for a bridging loan for your property upgrade. A broker will also assist in gauging the best option according to your circumstance. The total cost of return will be calculated after adding total interest. The loan provider company will give you the details of the interest rates while providing a loan. The interest rates on Bridging loans are much expensive than simple loans. Monthly interest: You have to pay the interest according to your interest rates per month. The balance of the loan will remain same. Rolled up Interest: In this type of system, you have to pay all the interest at one time. You have to pay the whole interest when original rent repaid. There are no requirements of paying rents monthly but the rent will be keep added every month. Retained interest: In this type, customers also borrow interest from the company or bridging lender when applied for the loan. A customer can pay monthly interest on this borrowed money.